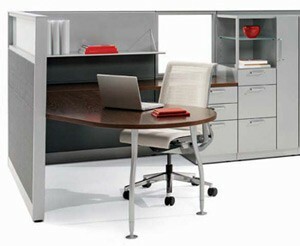 An L-shaped office desk is a popular style of desk in offices today. The L-shaped design combines form and function, and creates an ideal workstation in the workplace. So, when businesses across the nation are looking to furnish their offices with such desks, they turn to the professionals at Reimagine Office Furnishings (ROF). Since 1991, ROF has been a seller of well-made office furniture, offering new, used, and refurbished office desks. All of our furniture is from top manufacturers, including Herman Miller, Indiana Furniture, HON, Haworth, Steelcase, and more, which is why our used and refurbished office furniture is always top quality. Additionally, we sell our furniture at just a fraction of the manufacturer’s cost, so our customers receive durable, attractive office desks at an affordable price. In fact, some customers save up to 80 percent off the original price. Plus, our close proximity to a port and airport allow us to ship orders quickly, so no matter where you need office furniture, we can service you. For more information on any of our office desk styles, including an L-shaped office desk, contact Reimagine Office Furnishings today.